Saltash.net’s Mr. Budd commended at Cornwall Teacher Awards! 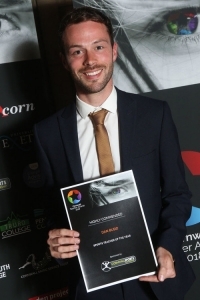 Saltash.net PE Teacher Mr. Budd has been recognised at the Cornwall Teacher Awards for his selflessness and hard work, having been shortlisted for Sports Teacher of the Year and “highly commended”. The ceremony, which took place at Truro Cathedral, saw Mr. Budd shortlisted for Sports Teacher of the Year alongside two other finalists, who had been whittled down from a huge number of nominees. Mr. Budd had been nominated by Lucy Freeman, a Trainee Teacher who Mr. Budd mentored at the start of the 2017-18 school year. The nomination was supported by Year 9 students Jas Maddocks and Taylor Broome, who were both involved in the nomination video which was played at the ceremony. “I feel very honoured and extremely grateful to have been nominated and shortlisted for Cornwall sports teacher of the year at the Cornwall Teacher Awards. Congratulations to all the winners and finalists who so clearly inspire their students and colleagues every day,” Mr. Budd said after the ceremony. Judges noted the incredible work that Mr. Budd does at saltash.net. “Dan displays selflessness in the work that he does. He represents himself as an empathetic teacher who seeks to empower his students through sport. It is clear that he understands the power of sport and how it can improve students’ passion in the classroom and, overall, improve their lives,” they said.